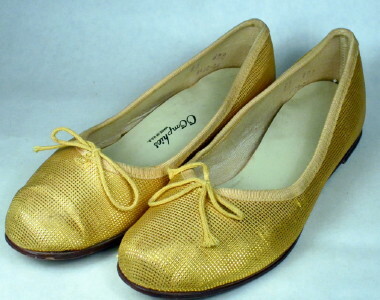 1950's vintage ballet flats. Woven metallic gold micro check pattern. Closed round toe. Throat edged with grosgrain ribbon and cord bow at vamp. Closed shank and quarter. Beige vinyl liners. Perfect little cocktail flats to compliment cigarette capris. Length, measured inside foot bed from toe to heel - 9 1/4"
Width, measured outside at widest - 3 1/8"
Excellent condition. Shows slight wear at liners & soles and very light soil marks at grosgrain edging.